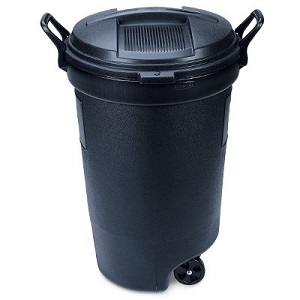 Tough and durable Roughneck outdoor trash can features 4" heavy-duty wheels. Locking handles. Size: 35" x 20.75" x 21.5". Heavy duty wheels provide easy portability for large loads. Friction fit lid with locking handles provides double security & protection against rodents and pets.